Hanging glassware dries quickly with minimal streaks and spots. Stainless steel cleansing beads make cleaning decanters quick and easy. Simply add water and gently swirl to clean hard to reach places. Rinse and reuse beads over and over again. 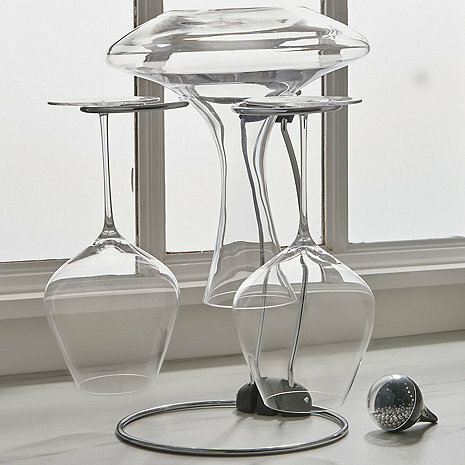 Safely air dry your favorite wine decanter and stemware with our compact free-standing drying rack. This rack takes up minimal kitchen counter real estate and folds flat for convenient, space saving storage in a drawer or cabinet. The set also includes stainless steel cleansing beads for easy and safe removal of residue, sediment and stains from difficult to clean bottles. Simply fill your decanter with a small amount of water, add beads and gently swirl for 1-2 minutes. Strain, rinse and reuse beads.